In the competitive world of real estate listings, there are volume listing agents. They are sometimes easy to spot. Does this agent remember this listing? Stop mooing and start moving! Considering selling your home or other property? Don’t be a cow! List with a Realtor® that adheres to the highest ethics in the industry and see’s your home as there one and only and not just one in the herd! What is Gold Post Service? Quality, not quantity representation. Gold Post Service is concierge service for your listing. I represent both buyer’s and seller’s, but only a few at a time. Low volume means you are important to me and get personalized, concierge like service. If the golden rule for real estate value is location, location, location. Getting highest and best, it’s answer the phone, answer the text, answer the email and now! #1 Fast or instant communication is critical in getting highest and best. Today’s buyer is computer savvy and grew up on fast food and microwave ovens. I’ll either answer the phone or return the call, email or text at lightning speed. From the first contact and throughout the process, you can count on me. #2 Passion for the business comes natural for me. I love the real estate business and the people. I will study your home and provide you a personalized comparative market analysis (CMA). I do not use automated pricing evaluations. You and your home are unique. Expect to see lot’s of notes on a lot of listings, not a computer print out. #3 Explain the process and keep you informed. Real estate has many twists, turns, bumps and detours. From our first meeting and throughout the process, I will let you know where we are, what could happen and what I recommend if we need to change our strategy and why. You’ll feel informed and confident and never alone, in the dark. How do you like to communicate? Phone? Text? Email? I will mirror whatever you prefer. Like a concierge, I will be the hub for getting things done. Whether we need to coordinate an inspection, a lender, a roofer, an appraiser or contractor, you can count on me to have the connections, the time and the resources to get things done. #5 My slogan is “Let’s get to work”. Expect to see me at each showing if needed. I’ll prepare your home for viewing to give the best impression each and every time. I routinely stop by each listing, bringing in the garbage cans and picking up the newspapers. I even carry a blower to clear your sidewalk and driveway if it needs it. You never know when opportunity could knock. The next drive by, could be the one! Opportunity is when you have a willing and able buyer and a willing and able seller or representative. Need to move a washing machine or get last years Christmas tree to the recycle center? (I’ve done both and more) I have a truck and won’t hesitate to use it to remove any obstacles to get the buyer and the seller together. No excuses! What is Gold Post Service? The combination of knowledge, compassion, fast buyer response, fast seller response, resources, communication, attention to detail and being genuine about it all. 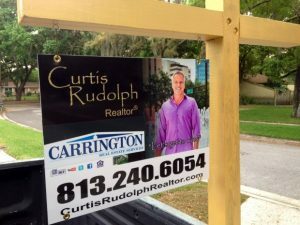 Curtis Rudolph Realtor® is your concierge service for your real estate listing. Call today 813.240.6054 and experience the difference of Gold Post Service!